My wife’s comment pretty well sums it up! “I can drink that,” she says with a smile and a nod of her head. 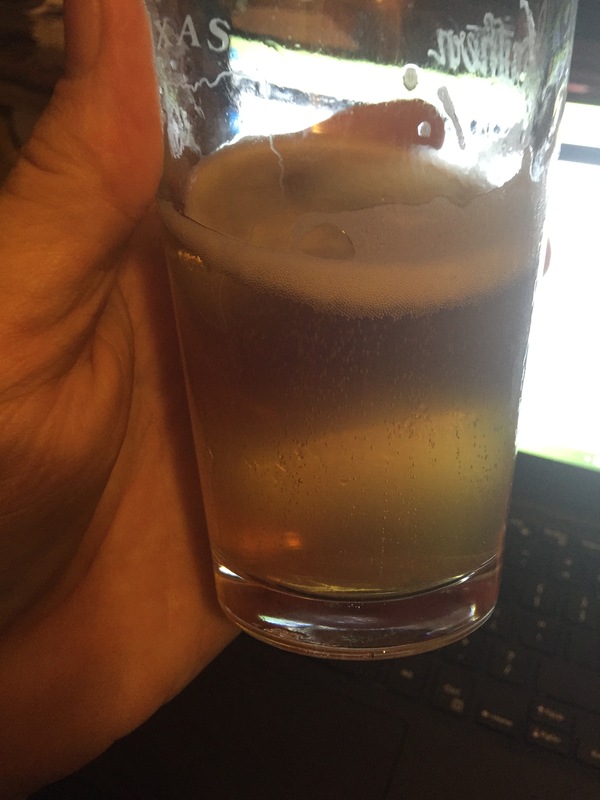 I am a little more critical and would like to see a little more carbonation…It has been about two weeks or so since I bottled it. I will give them all a little shake to stir up the yeast to wake them up and then sample again in a week. Flavor is very nice….not tickling my hop loving palate but it was designed to please the love of my life – her nose goes up and wrinkles when one of those “hop bombs” that I love comes anywhere near her nose. The color….definitely honey as you can see from the photo below. 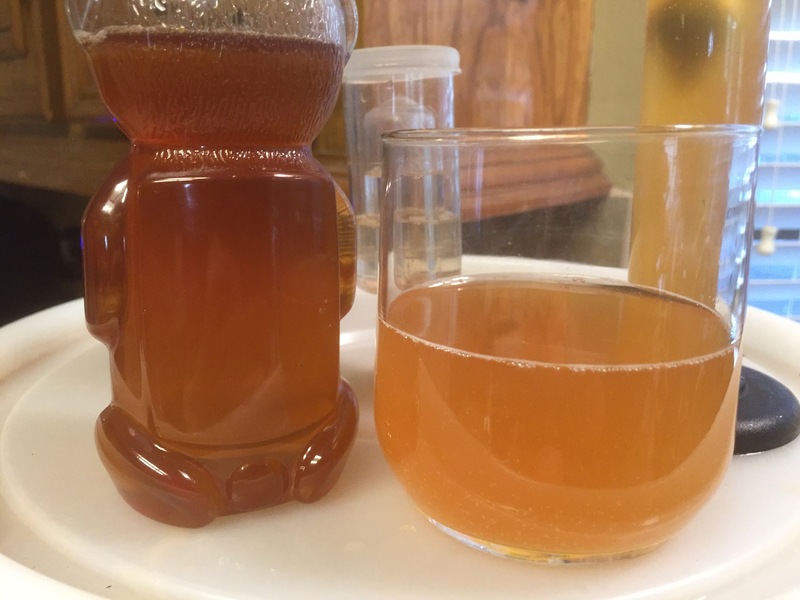 There is a bit of honey taste and aroma….I used my dark and robust honey in the recipe…it does come through. Nice beer….look close and you can see some bubbles rising and this blog post in progress on the lap top in the background. Choices…… the freezer is now available for use as a fermenting chamber….. I had a hive super that the bees had cleaned for me residing at 10 degrees F for a few days….kills any wax moth eggs that may be lurking and wanting to do their damage. The super is out, wrapped and ready for service next spring! Maybe a tandem effort….a mead and an Imperial IPA…..yeah that sounds good! I racked the Honey Blonde from the primary to the secondary fermenter this morning. I was a few days tardy but it should not hurt the final product. I hope to bottle over the weekend and sit back and enjoy a cold one on or around October 17/18. The hydrometer reading indicates that fermentation is complete so I will let the beer clear up in the glass carboy secondary for a few days, chill, then bottle. ABV calculates at 5.64%. Not an all day session beer but very nice. I drank the sample I pulled – can’t let it go to waste! Color is nice – like a light honey color…. Go figure. Yes, a bit of sweetness in the flavor and a pleasant after taste. From left to right, my honey in a squeeze bear, a bit of the extra sample I pulled and the hydrometer sample back right. The honey color is definitely evident. The beer should clear up nicely in the next few days….. I will keep all y’all updated.